There were a man and a woman. Alive during the dictatorial regime of the 1970s, both secretly dreamt of another world. The two met at an evening school, where they educated workers as voluntary teachers in Gwangju, a southwestern South Korean city. While working hard to educate workers, the woman died in an accident. It was 1978. The woman, Kisoon Park, was 21. After dictator Park Chung Hee was assassinated in 1979, and another dictator, Chun Do Hwan grabbed power through a coup d’état. Martial law was imposed nationwide. 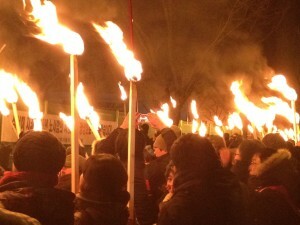 Students in Gwangju protested the repression of their democratic rights. The military suppressed them violently. In reaction average citizens rose up. They were met with horrible violence, beaten and shot to death. Civilians bore arms and occupied the city hall. The man joined them and was shot dead there. He had been the spokesman and one of the leaders of the civil troops. It was 1980. The man, Sangwon Yun, was 30. In 1982, there a wedding was held at a graveyard. The man and the woman were spiritually bound together as bride and groom. A song entitled, &#34;March for the Beloved&#34;, was written and dedicated to them. After, it spread secretly among students, workers, and ordinary citizen. With the march of the democratization movement in South Korea, this song has come to be sung at the opening of every rally. Once in 2010, when the Lee Myung bak administration refused to play &#34;March of the Beloved&#34; in the annual ceremony commemorating the Gwangju Democratization Movement, twitter users voluntarily organized a campaign to sing along it. The song has come to represent social movements in South Korea. &#34;March of the Beloved&#34; also has impressed many activists around the world. The song has been adapted and sung in many countries including Hong Kong, Thai, Myanmar, and China. On March 25, thousands of Korean anti&#45;war activists, union members and ordinary citizens gathered Seoul Plaza for a series of massive people&#39;s rallies. The protesters gave voice to many demands related to the livelihood and safety of ordinary Korean people: repeal of the U.S.&#45;Korea Free Trade Agreement, the cessation of the construction of the Jeju naval base, the guarantee of workers&#39; rights to a living wage and job security. Many people are not familiar with the Nuclear Security Summit. Most Koreans had not even heard about it until the Lee Myung&#45;bak administration began advertising it as the &#39;largest international meeting ever to be held in South Korea&#34; a few months ago. Even after the billboards and television adds appeared, few have a clear sense of what the summit is about, given that that the government has done little to explain its details. The rally on March 25 provide anti&#45;war and anti&#45;nuclear activists a chance to spread awareness about the true character of the summit as a means for the U.S. and other nuclear weapons states to defend their nuclear hegemony and for the South Korean government to promote the development of its nuclear industry and export of nuclear power plants. What is the Nuclear Security Summit? The Nuclear Security Summit is a meeting of the heads of states and representatives of international organizations &#40;the UN, the IAEA, the EU&#41; to discuss the prevention of nuclear terrorism and the securing of nuclear materials and facilities. U.S. President Barak Obama first proposed the summit a speech in Prague in April 2009. In the same speech, Obama called for a world free of nuclear weapons, while paradoxically also promising that the U.S. &#34;will maintain a safe, secure and effective arsenal to deter any adversary, and guarantee that defense to our allies,&#34; as long as nuclear weapons exist. The first Nuclear Security Summit was held in Washington D.C. in 2010, and the second in Seoul last month. The ideas of &#39;nuclear security&#39; and a summit of world leaders to discuss it sound good. In fact, however, the term and the meeting are part of the United States&#39; efforts to maintain its nuclear weapons dominance, while also appearing to take steps towards a nuclear&#45;free world. The premise of nuclear security is that the greatest nuclear threat comes not from nuclear weapons themselves, but from the possibility that nuclear materials, the main ingredients for nuclear weapons, will fall into the hands of terrorists or other &#39;irrational&#39; non&#45;state actors. While the Nuclear Security Summit discusses cooperation for securing such nuclear materials, it does not address the fact that over 20,000 nuclear weapons, enough to destroy humanity several times over, already exist in the possession of governments who have not ruled out their use. &#39;Nuclear security&#39; is a fairly new word in U.S. foreign policy vocabulary. Until recently, the focus has been on &#39;nuclear non&#45;proliferation&#39;. The concept of &#39;nuclear non&#45;proliferation&#39;, enshrined in the Nuclear Non&#45;proliferation Treaty &#40;NPT&#41; , is that states without nuclear weapons will be blocked from obtaining them while nuclear weapons possessing states will take steps towards nuclear arms reduction and eventual elimination. In fact, however, the U.S., along with the other acknowledged nuclear weapons states under the NPT &#40;Russia, the U.K., France and China&#41; have used the NPT and the concept of non&#45;proliferation to pressure and control non&#45;nuclear states, while refusing to give up their nuclear arsenals. Recently, the Obama administration has made small steps towards nuclear arms reductions. These including the signing of a deal to reduce the number of deployed strategic nuclear warheads with Russia &#40;the New Start Treaty&#41; in 2010, and consideration of further reductions currently underway. In fact, however, the U.S. is currently spending hundreds of billions of dollars to modernize nuclear weapons production facilities and develop new nuclear weapons that are more precise, less powerful and, therefore, more useable. The U.S., moreover, has repeatedly stated it considers a preemptive nuclear strike against its enemies an open possibility. Far from preventing the proliferation of nuclear weapons, the drive of the U.S. and other nuclear weapons states to maintain their nuclear hegemony has provoked other countries to develop their own nuclear weapons programs. Of particular importance in Asia, North Korea withdrew from the NPT in 2003, citing the United States&#39; failure to fulfill its promise to provide fuel and light water reactors to replace its existing nuclear program. It has since carried out two nuclear tests. In the face of growing critique of the contradictory nature of the NPT system and its inability to stop proliferation, the U.S. has recently begun to stress nuclear terrorism as the main nuclear threat. It proposes international cooperation towards &#39;nuclear security&#39; as the best response. Like non&#45;proliferation, however, nuclear security measures leave the United States and other nuclear weapons states&#39; arsenals intact while further provoking countries deemed &#39;capable&#39; of leaking nuclear materials to terrorists. Given that North Korea is high on the list, this policy contributes to heightened tensions on the Korean peninsula and, by extension in the East Asian region. A representative example of international nuclear security cooperation is the Proliferation Security Initiative &#40;PSI&#41;. PSI calls on participating states to stop and inspect aircrafts or ships &#39;suspected&#39; of transporting nuclear materials or weapons of mass destruction &#40;WMD&#41; and authorizes the use of military force in the process. PSI specifically targets North Korean vessels. It has thus been taken by North Korea as an act of aggression, even more so since South Korea became a full PSI member under the present administration. Many scholars have also criticized PSI as a violation of international law because no international treaty regulates it and because it goes against the internationally guaranteed right of free passage across open seas. In 2004, the U.S. sought to provide PSI with at a degree of legal backing through the adoption of UN Security Council Resolution 1540. Resolution 1540 requires UN member states to take and enforce effective measures against the spread of WMD, their means of delivery and related materials. Resolution 1540 has been a subject of both Nuclear Security Summits. A working paper submitted to the first summit called for its full implementation. During the second summit, France announced plans to host an international conference on implementation by the end of the year. Given the resolution&#39;s implications, these discussions can only be taken as acts of provocation by North Korea. In addition to talk of &#39;nuclear security&#39;, the Lee Myung&#45;bak administration had another very specific goal for the Nuclear Security Summit: promotion of the South Korean nuclear power industry in line with its plans for nuclear power plant export. As a side event to the Nuclear Security Summit, the Lee administration held a &#39;Nuclear Industry Summit&#39; on March 23. At this meeting, 200 industry leaders came together to discuss &#34;safety measures&#34; for nuclear power plants. It has only been a year since a nuclear disaster the size of Chernobyl struck Fukushima, Japan, devastated the surrounding community and releasing radioactive materials that will effect residents and the environment for years to come. Just last month a dangerous blackout occurred at a nuclear power plant at the southern end of the Korean peninsula leading to an attempted cover up by South Korean authorities. Despite the very obvious continued dangers, the Lee administration&#39;s publicity materials for the summit blatantly referred to it as &#34;a chance to rebuild trust in the atomic energy industry, which has diminished in the wake of Fukushima.&#34; The day after the Nuclear Industry Summit, participants were taken on a tour of Korean nuclear power facilities, a blatant sales pitch on the part of the government. There is no such thing as safe nuclear power or secure nuclear materials or weapons. As long as nuclear power is generated, as long as nuclear weapons exist, we face a grave nuclear threat. In addition, the more the U.S. persists in its policy of preemptive nuclear strike and threatens North Korea with &#39;security&#39; measures like PSI, the more likely it is that the Korean peninsula will become a staging ground for nuclear war. The real task before us, then, is not the prevention of nuclear terrorism, but the elimination of the more fundamental threat: nuclear weapons, nuclear power plants and policies that stimulate their development. That the U.S. and South Korea have held Nuclear Security Summits while refuses to acknowledge these realities is not only contradictory, it is highly perilous. The rally on March 25 offered an opportunity to raise these issue before the Korean public and criticize the hypocritical and dangerous nature of the Nuclear Security Summit. It is now up to Korean anti&#45;war activists to organize a more sustained grassroots ant&#45;nuclear movement in Korea and connected it other similar movements around the world. There are over 400,000 janitorial workers in South Korea. Of these, only 7,853, roughly 2&#37;, were members of labor unions as of 2011. Only 2&#37; of some 400,000 janitorial workers in Korea are organized. Despite this low figure, Korean janitorial worker&#39; struggle has received considerable attention for many reasons. In particular, Korean janitors have refused to be satisfied with South Korea&#39;s miserable minimum wage. They have fought for and won a collective bargaining agreement that guarantees them wages above the legal standard. In addition, Korean janitors have built solidarity across workplaces and succeeded in carried out joint collective bargaining. Last year, janitorial and security workers organized by the KCTU-affiliated Korean Public Service and Transportation Workers Union &#40;KPTU&#41; at 3 universities &#40;Korea University, Yonsei University and Ehwa University&#41; and one hospital &#40;Korean University Hospital&#41;, made the first attempt at a multiple worksite struggle and joint collective bargaining. 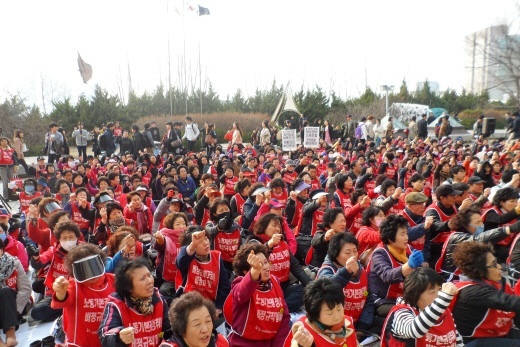 The general strike of these workers &#45; the majority elderly women &#45; carried out on March 8, International Women&#39;s Day, made a lasting impression on the Korean labor movement. Through their struggle, these workers won a collective agreement guaranteeing them an hourly wage of 4,600 won &#40;roughly $4&#41;, 240 won above the current legal minimum. The effects of that victory were felt throughout Korean society. Notably, 4,600 won served as a standard for the tri-partied minimum wage committee in its deliberations on a new standard for 2012. This year the janitorial and security workers have expanded their struggle. Workers at Hongik University and Kyung Hee University have joined the four other worksites to fight for a joint collective agreement. The workers began by demanding an increase to 5,410 won half the average for all workers. As of now, they have reached a preliminary agreement for 5,100 won. Unfortunately, this year the janitorial and security workers face new challenges. This is because of a revision to the Korean labor law that went into effect on July 1, 2011, which allows more than one union to be formed at a workplace, but require that their be only one bargaining representative. After the law was passed, yellow unions were formed and the school administrations and subcontracted cleaning companies have used them as an excuse to refuse to bargain with the democratic unions. 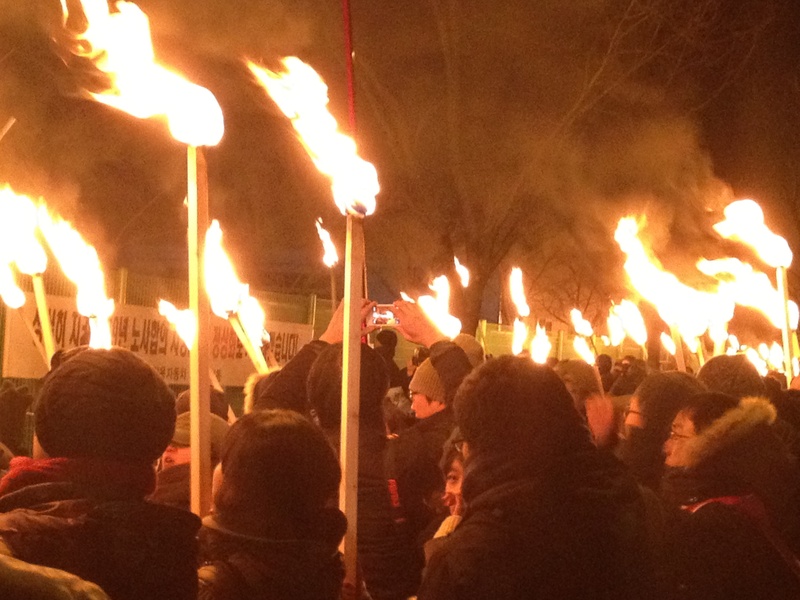 The yellow union at Hongik University is becoming a major obstacle to the workers&#39; goals. The yellow union has agreed to a low wage with the employer and is trying to convince the KCTU&#45;KPTU union members to agree to accept the same standard. The employer is using this as an excuse to refuse negotiations with the democratic union. Workers at all worksites have agreed that they will not leave their comrades at Hongik University behind. They began the fight together and will end it together and so are confronting the Hongik yellow union and will not sign a collective bargaining agreement unless it includes the Hongik democratic union members. Throughout history, Korean labor law has been used to repress workers. And throughout history, Korean workers have fought back in the fact of that repression. The story of the janitorial and security workers is one and the same. The Korean government responded to the 2009 struggle with brutal and bloody suppression. It mobilized armed special police forces and helicopters, which rained pepper spray on the desperately struggling workers. The struggle ended with the company agreeing to reinstate the dismissed workers after a year of unpaid leave. Yet neither the government nor the company has shown any accountability in the aftermath. Not even a small part of the agreement reached between the workers and management has been implemented. In the meantime, 22 workers and their family members have committed suicide due to deep sorrow and desperation. Continuing the struggle, the Korean Metal Workers Union Ssangyong Motor Branch and many social movement organizations including PSSP have pitched &#39;Hope Tents&#39; in front of the Ssangyong Motor factory in Pyeongtaek since December 2011. They organized national demonstrations called &#39;Day of Siege against Ssangyong Motor&#39; three times in December, January and February. Thousands of people participated. On April 21, they will hold the 4th &#39;Day of siege&#39;. The Ssangyong Motor struggle epitomizes key issues faced by Korean workers, including mass layoffs, state violence and speculative foreign capital. We must build broader and firmer solidarity and strengthen our struggle if we are to win reinstatement of the dismissed workers, prevent further deaths and confront the wider social problems that Ssangyong Motor represents. You are currently browsing the People's Solidarity for Social Progress blog archives for April, 2012.